This dish is originally from Mexico & it is quick & simple to make which makes a great snack or part of a meal. 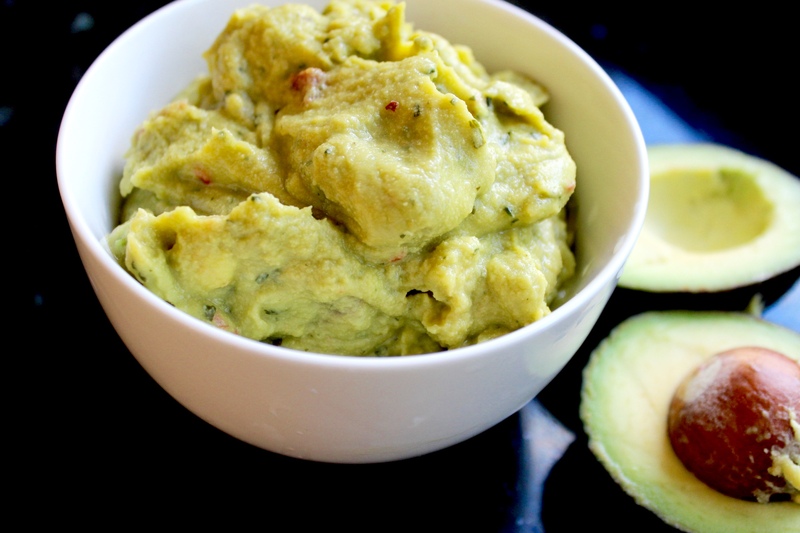 The key to perfect guacamole is to use good & ripe avocados. Cut the ripe avocados in half & remove the stones. Scoop out the avocado & dice into small cubes & then place in a mixing bowl. Use a fork to roughly mash the avocado. Sprinkle with sea salt & a little lime juice. The acid from the lime juice will help delay the avocados from turning brown. Add the chopped onion, coriander, chilies, & black pepper. Store in a sealed container in the fridge until ready to serve. I would recommend adding the tomatoes just before serving. If added to soon they have the ability to alter the flavour by producing additional water to the dish. Guacamole is highly nutritious as it is packed full of fiber, potassium, & contains lutein, magnesium & the healthy monounsaturated fat. Avocados are great for improving our absorption of nutrients from other foods. Additionally the vitamin C in guacamole enhances our absorption of both calcium & iron. It makes the perfect, nutritious snack with vegetable dips between meals & has the ability to provide satiety along with providing essential vitamins & minerals.